Every week throughout the Summer, I will be revealing a new flavour of delicious 'icecream', using a frozen banana base to create an array of delicious, low-fat and exciting recipes. These are large, layered desserts served in tall glasses and are mouth-wateringly fabulous. 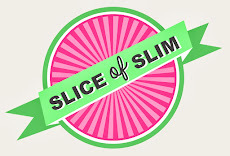 Slice-of-Slim versions, to prove that we slimmers don't have to miss out on these decadent treats. If you like Jaffa cakes, you'll love this. This dessert will only set you back 5pp/approx.350kcal per portion! 1 batch of frozen banana 'icecream' base using 2 medium or large frozen bananas. 1 sachet Options "Outrageous Orange"
Make a batch of banana 'icecream' base. Pop it into a mixing bowl and store in the freezer while you prepare the other elements of the dessert. Rinse out the bowl and blade from the food processor, then blitz the frozen mango to the 'cous-cous'or granular stage. Slice up each mini roll. Cut the peel off the tangerines and cut the fruit into segments, away from the pith. (I don't have any sundae-style dishes, so I just use tall drinking glasses). Take the banana chocolate-orange mixture out of the freezer. Sprinkle with grated chocolate and a little tangerine zest for a spectacular finish. All that's left to do is to choose a funky spoon and dig in. Serve immediately and enjoy all the various flavours, textures and sensations for a Jaffaliscious experience! You could make 4 mini Slimmerbocker Glories for 3pp/approx.175kcal each from this recipe.